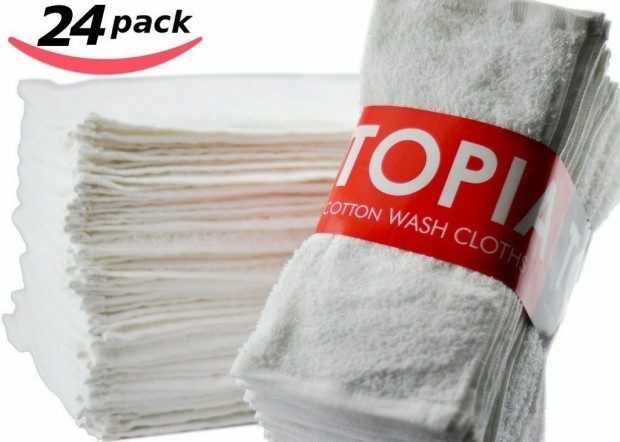 Utopia Towels Washcloths 24 Pk Only $13.99! Down From $30! You are here: Home / Great Deals / Amazon Deals / Utopia Towels Washcloths 24 Pk Only $13.99! Down From $30! Time to dump those ratty old washcloths before guests arrive for the holidays! Head over to Amazon to order a Utopia Towels Washcloths 24 Pk for Only $13.99! Down From $30! Get FREE shipping on orders of $35+ or if you have Prime! VALUE BUNDLE – 24 wash cloths for your home or dorm room. Size 12″ x 12″ inches in bright white. 100% Satisfaction & Money-Back Guarantee. SUPER SOFT – Terry towel wash cloths manufactured using 100% soft ring spun cotton. Material remains soft after washing and drying. EXTRA ABSORBENT – Looped terry design is extra absorbent and retains moisture. Washcloths dry quickly. QUALITY – Commercial grade wash cloths like those used in hotels; Reinforced edges to prevent unravelling. Average weight is a standard 1 lb per dozen. EASY CARE – Machine washable and dryer safe. Wash cloths are durable and stand up to multiple wash cycles. Enhanced for lasting whiteness and shape. Bleach proof.